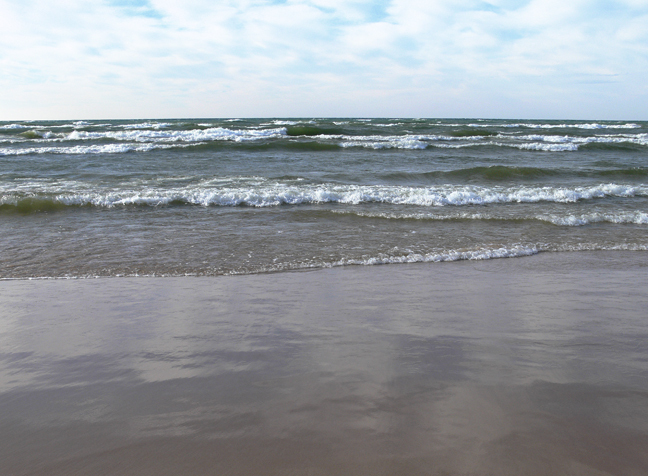 During Summer, waters along the East shore of Lake Michigan are much warmer than waters along the Western shore. The reason: prevailing wind. West winds blow across the lake pushing sun-warmed waters Eastward. Along the Western shore cold waters roil up from the bottom in their stead. Taking a dip on the Western shore is nearly always a chiller while swimmers on the Eastern shore seldom complain. But in Winter those same prevailing winds can load up with moisture in a vicious manner. Lake effect snowfalls within 50-60 miles of the shore can be unpredictable and extreme. In the meantime, spray can ice the shores in layers several meters thick, treacherous to walk upon. Late Fall and early Spring are perhaps the most beautiful of times, when breezes are too crisp and chilling for comfort and most people stay inside.